When you’ve got someone in your household that is allergic to dairy, eggs, and nuts finding treats for them can be very challenging. Most ready made snacks contain at least one or more of these allergens or are made in a facility that uses these ingredients. So really the best solution is to make homemade snacks, that way you know they’re allergen free. That’s pretty much what we do for my grandson Jett. And one of his favorite snacks are Vegan Rice Krispy Treats. We used to make a vegan and non-vegan versions of the same snacks, but that just got too tedious. Then we discovered that the other kids will happily eat the Vegan Rice Krispy Treats so we just started making the vegan version. Really you can convert most of your recipes into a vegan version, just find substitutes for animal products. The hardest thing to sub in my opinion are eggs, but since the original recipe for rice krispy treats don’t require eggs any way Vegan Rice Krispy Treats are the perfect choice to start with. 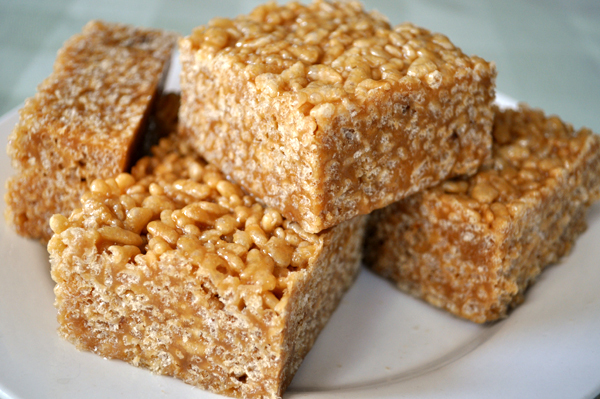 The recipe for these treats have just 3 ingredients rice krispy cereal, marshmallows, and butter. Easy enough to substitute right? Well it should be as long as you can get your hands on vegan marshmallows. What? You thought marshmallows were already vegan? Surely you jest! First of all one of the ingredients in marshmallows is gelatin, and gelatin is an animal product. Don’t ask me to go into details, but if you don’t believe me ask Siri or Alexa. Anyway there are vegan marshmallows in the market, you just got to find some! The most popular ones seem to be Dandies Vegan Marshmallows, we use the mini ones for Vegan Rice Krispy Treats, I find they melt better and faster than regular sized marshmallows. Ok we got the vegan marshmallows now we need to find a substitute for the butter, now butter is definitely an animal product, but you knew that right? There are several brands to choose from, we use Earth Balance. Now that’s 2 out of 3 we got substitutes for, now for the good news. Rice Krispy cereal is Vegan! Yaaay! We’re ready to roll! Did you know that there are seasonal Rice Krispy cereals? Yes there are! It’s the same cereal, they just mix in seasonal colors like red and green kernels for Christmas. So if you’re making holiday treats look out for the seasonal cereals to make your Vegan Rice Krispy Treats more fun! This is the most effective … ever!” I laugh whenever I scan such a claim and not as a result of I don’t believe them. I do believe them as a result of I mean it whenever I say it too. It’s simply typically we have a tendency to find yourself feeding our words after we realize one thing else that’s “the best ever”. Thus with cautious optimism, I with boldness state this can be the most effective ham ever! By golly, I mean it too! Last year I shared a beautiful ham instruction and claimed it to be the most effective ever. I truly stand by the tactic of cookery the ham to be the “best ever” however I realize this glaze to be way superior to the coca-cola sauce I created for the opposite ham. 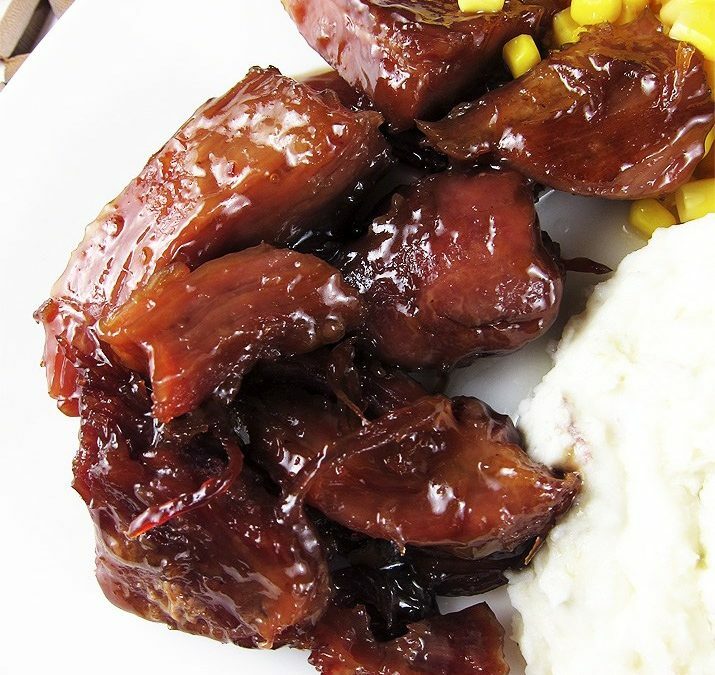 The glaze fantastically coats the ham with a lightweight, sweet, however not too sweet, sauce. It tasted wonderful, really one in every of the most effective things I’ve ever created. I virtually created yum sounds after I Ate this. Max wasn’t affected by my manners as he gave Pine Tree State cat side-eye whereas I Ate my dinner. Personally, i feel he was simply jealous. He doesn’t build yum sounds whereas he eats!Again, this technique of cookery ham is uncommon however leads to Associate in nursing implausibly tender and damp ham. The ham just about falls apart as a result of its thus tender, like force pork, thus you won’t find yourself with nice, thick slices. 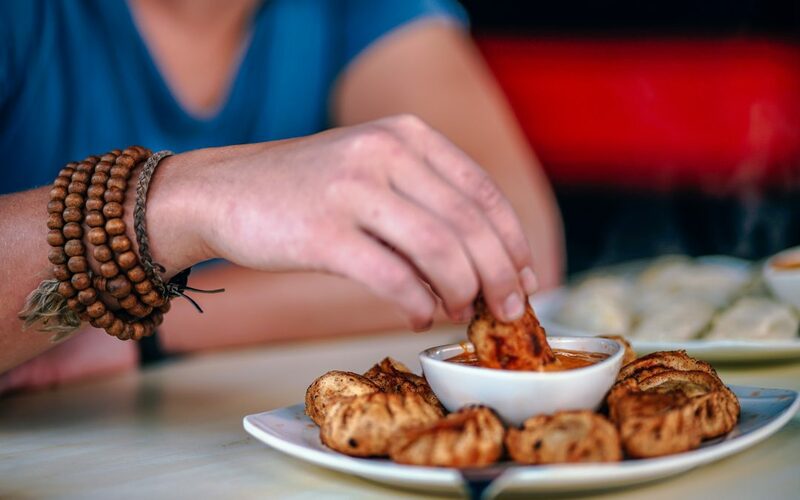 However, tender morsels versus slices are unquestionably not a deal breaker to Pine Tree State once the top result’s thus succulent and attractive. Because it will cook during a water/vinegar mixture, the ham will have Associate in nursing initial sour bite, that doesn’t trouble Pine Tree State. However although you’re involved that, don’t worry. Once you coat it with the sweet glaze, it’ll be heaven on a plate. This dish is ideal for company as a result of you cook the ham the day previous (your house can at first combat a sour smell), to serving, creating it the proper dish for Easter. 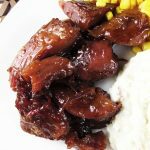 You’ll be able to even prepare the glaze the day before, thus all you would like to try and do is mix the ham and glaze and heat up within the kitchen appliance or slow cooking utensil. Click here for Ham with Pineapple Brown Sugar Glaze recipes enjoy! Place the ham in a large pot and cover with 2 parts water to 1 part vinegar until the ham is covered by at least an inch or two of liquid. Bring to a slow boil and cook for approximately 3-4 hours (without a lid) or until the meat falls off the bone. Depending on the size of your ham, you may need to adjust the length of time you boil your ham. You should not be able to remove the ham without it falling apart. Carefully remove the ham and cool for 30 minutes or until you can touch the ham without burning your fingers. Shred the ham or cut into large chunks and place in a large container and refrigerate. In a medium pan, combine pineapple juice, brown sugar, balsamic vinegar, dijon mustard, cornstarch and water together over medium-low heat. Bring to a boil and stir until slightly thickened. Refrigerate until ready to reheat the ham. Combine glaze with ham and place in a 9×13 pan. Cover with aluminum foil and bake in a 350 degree oven for 1 hour or until heated through. Boiling the ham in the vinegar/water mixture results in the most tender ham. I can eat the ham without the glaze, but for others, it will be too tart. I’ve added leftover ham (without glaze) to soups, omelets, scalloped potatoes with no problems. If you are still concerned, you can also bake the ham (that is not intended for the glaze but to be enjoyed in other dishes) with some brown sugar to minimize any vinegar taste. 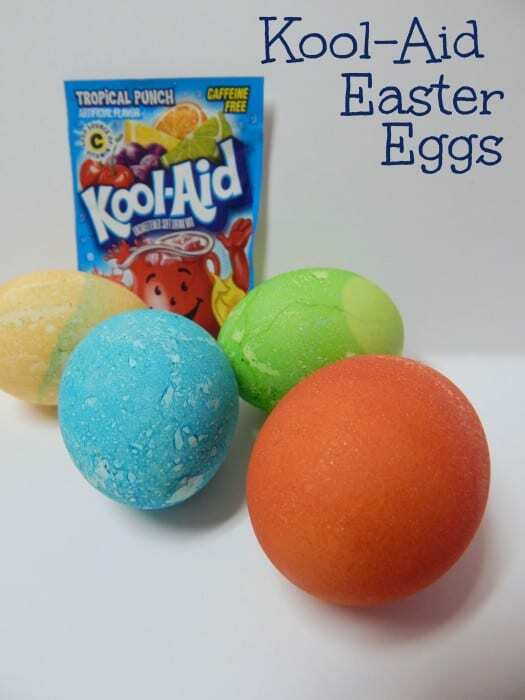 This year Easter will be April 1, that means we’ll dying Easter Eggs later this month..
All the discount and dollar stores are selling egg dying kits and many of us find it easier to just buy a kit and call it a day. We’ve done this many times and somehow are always disappointed with how it turns out. Our eggs never seem to look like the pictures on the box. Those kits really don’t sell you anything more than 4 tablets or packets of food coloring, a flimsy wire “egg dipper”, and simple instructions on how to mix the dye. This year we’re going to do it differently using supplies we already have in the house; food coloring, napkins, sharpies, and other crafting supplies. 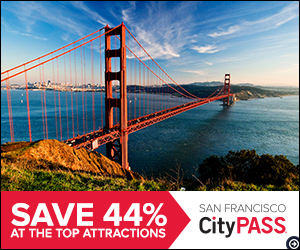 Here are some great ideas and tips you may want to try this year. 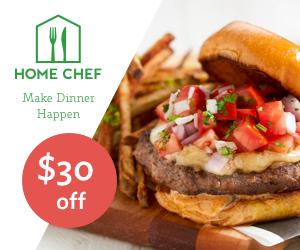 Most of them use things you already have in the kitchen and are designed to make the activity neater and easier. Click on the photos for instructions. Before you begin you will need hard boiled eggs. 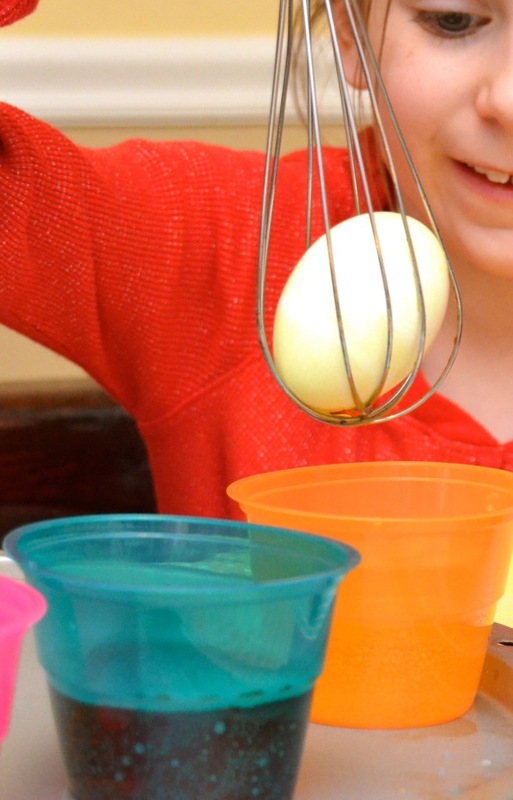 Here’s a tutorial from Recipe Lion on how to boil the perfect egg. Click here for tutorial. 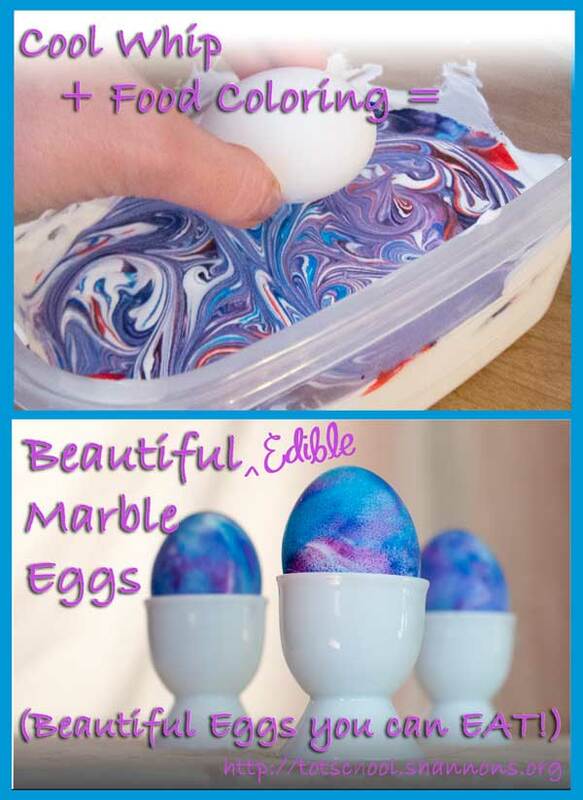 Make edible marble eggs using Cool Whip and food coloring. Learn how from Shannon’s Tot School. 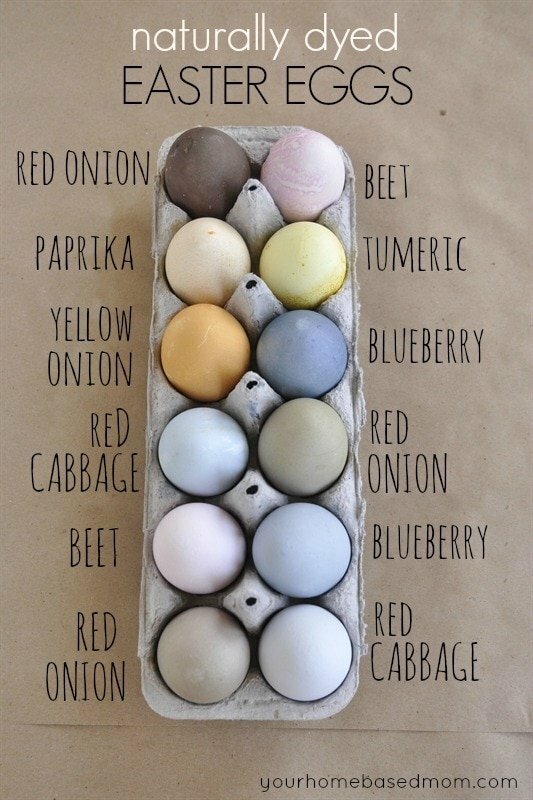 After you’ve make all these lovely Easter Eggs you may find yourself with a ton of hard boiled eggs! 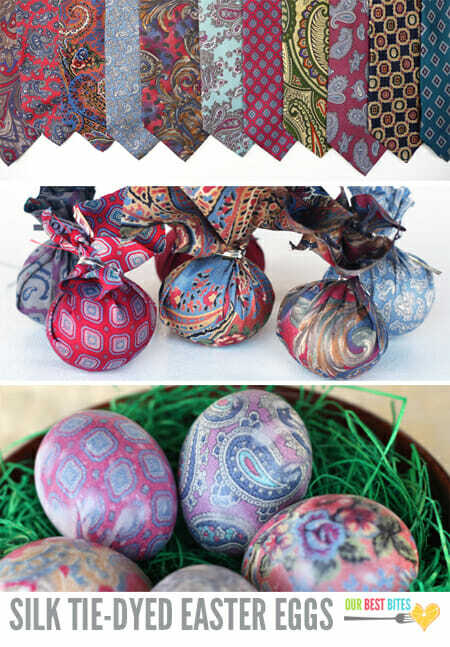 Don’t let the eggs go to waste! 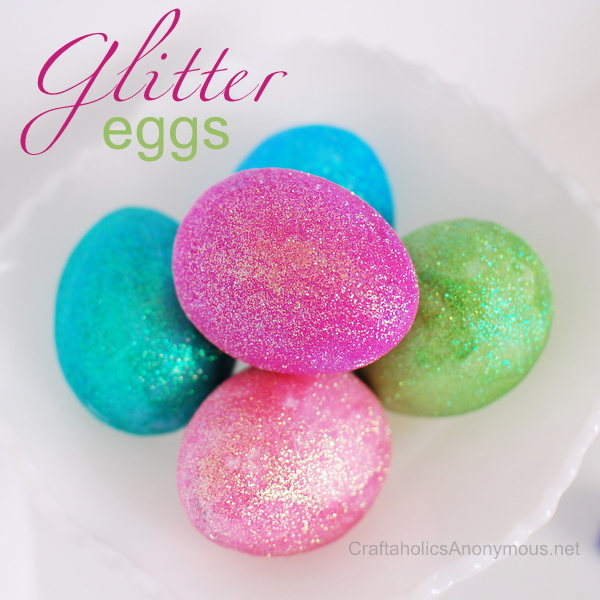 Check out my post 12 Recipes To Use Hard Boiled Easter Eggs! If you haven’t already heard our family loves holidays, we like to celebrate every single one. 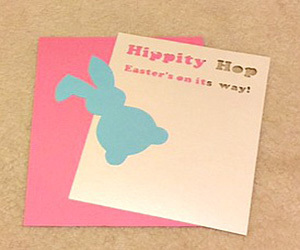 Right now Easter’s coming soon and we’ve been busy with various craft projects. 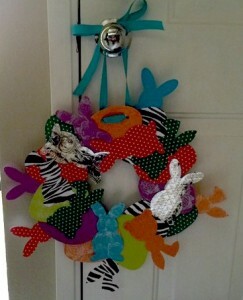 We’ve made pom pom bunnies and chicks, chick aviator hats and peek-a-boo bunny hats, and Easter plaques. 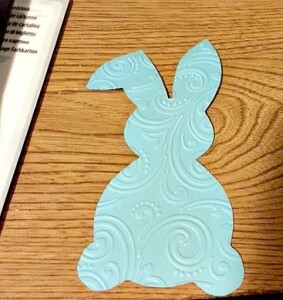 The last couple of days I fired up my Cricut Explore Air cutting machine to cut some Easter bunnies and eggs to use for our paper projects. 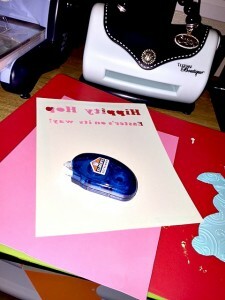 To add texture to the cardstock I used my cute little Sizzix Texture Boutique Embossing Machine. 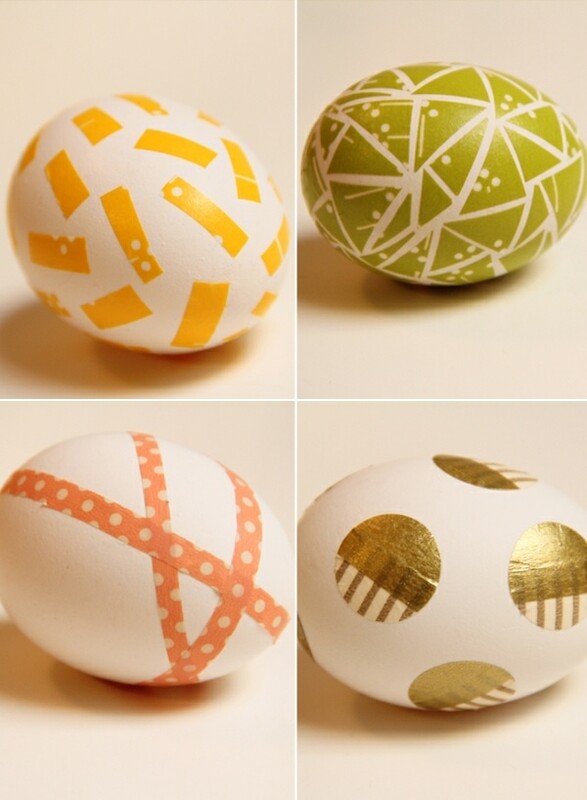 Here are some of our Easter Paper Crafts for the Entire Family! I’m sharing some templates too! Many of these projects are very simple, all you need are cardstock or construction paper, glue, scissors, small pom poms, and scraps of ribbon and twine. 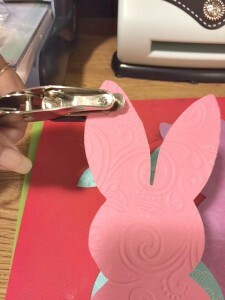 If you have a cutting machine you can definitely use that to cut out cute little bunnies; if not you can use the free templates I’m sharing and cut them out by hand. Click here for templates! It’s free! Frame – any size you want, mine is 11″ x 14″ which holds an 8″ x 10″ photo. Cardstock – any color you prefer, I used dark pink for the background, pearly white for the front card, and blue for the bunny. If not you can stencil the words on, or use stickers. Or you can just print them on with a marker! 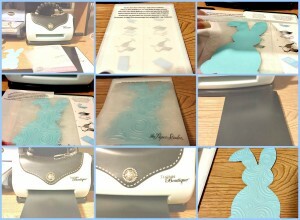 The picture tutorial below will show you how to emboss with the Sizzix Texture Boutique! It’s a cute little machine that’s shaped like a purse. 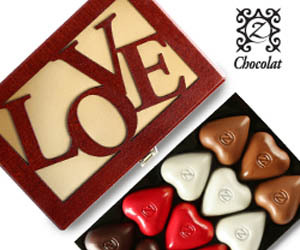 The item you want to emboss is placed into an embossing folder (sold separately in different designs). The folder is then sandwiched between the 2 black plates and in this case because I was embossing a single sheet of cardstock, a mylar shim (plates and shim is included with the machine). Once you’ve cut and embossed all the pieces it’s time to assemble the picture. 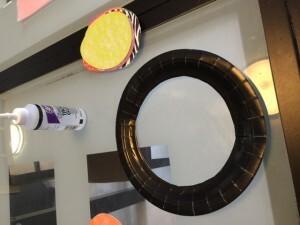 I used Elmer’s Craftbond Glue Runner, to glue all the pieces together. Finally I used Aleene’s tacky glue to glue on the pom pom then placed it in the frame. 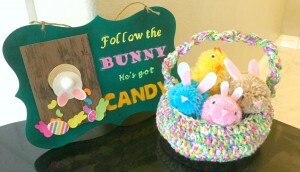 Another Easter Paper Craft we did is this adorable Bunny Banner. We also made this vertical Bunny Banner using glitter paper. 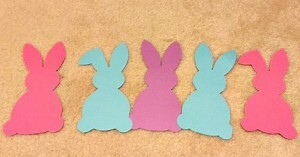 I cut the bunnies from glitter paper which we glued vertically along a strand of ribbon. We glued on the pom pom tails and tied on a bow. Easy! 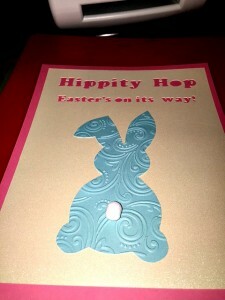 Again I cut out bunnies and eggs on the Cricut and embossed some, and stamped others. 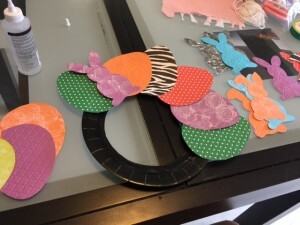 Then I cut a circle out of the middle of a paper plate and let the kids glue the eggs and bunnies on it. When they were done I punched 2 holes on the top of the wreath and threaded a length of ribbon thru for hanging. 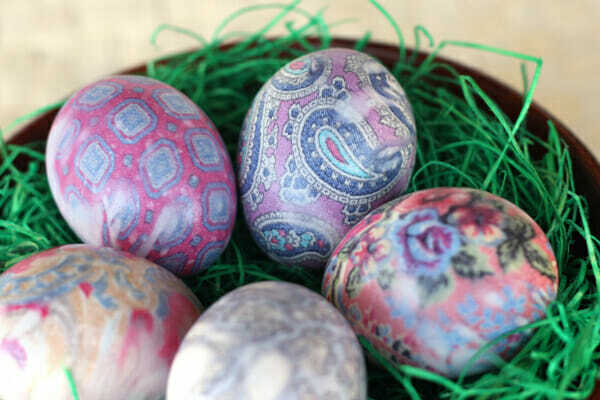 These are just a few crafts the whole family can do this Easter season. 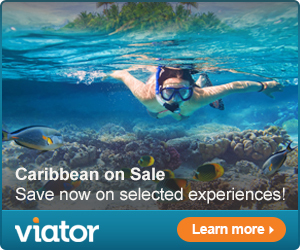 They are all very inexpensive, easy, and fun. You can decorate your whole house! You can even use the cut outs to make cards and signs. 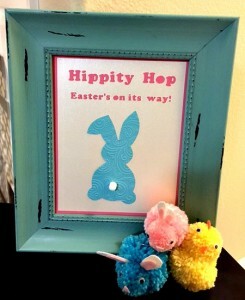 Check out my Easter Plaque craft! Pom Poms are one of the easiest and cutest way to dress up holiday decor, clothing, and gifts. 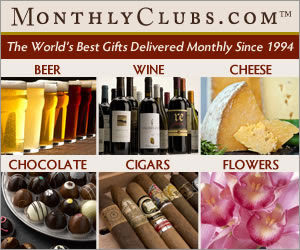 They make great add-ons to gift wrap and tags, banners, baskets, and more. 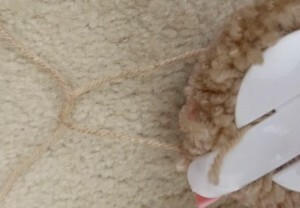 They are very inexpensive, specially if you make them at home using scraps of yarn. Best of all they are so easy to make and are a great project to do with your kids. I love to add pom poms to my crochet hats, they make them super cute. But since it’s Easter in a couple of weeks I’ve been making these adorable pom pom bunnies and chicks to add to the Easter baskets I’m making for my grandchildren. I used Pom Pom makers to make the pom poms for my bunnies and chicks but if you don’t have any you can still make pom poms very easily using a fork or toilet paper rolls and a pair of sharp scissors. Here’s a tutorial from Handimania to show you how to make pom poms using a fork or toilet paper rolls. 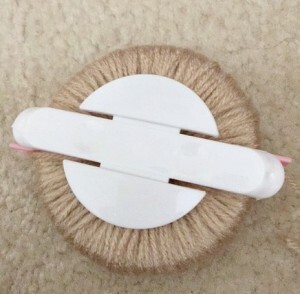 If you prefer to purchase a pom pom maker here’s a link for that too! 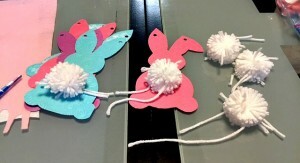 Sets of Pom Pom Makers start at around $6. Or you should be able to find them at your local craft store like Joann Fabric & Crafts. Here’s how I made my cute Pom Pom Bunnies and Chicks! I should add that it’s best to use sharp scissors, it makes cutting the yarn so much easier and less painful on your hands and fingers! 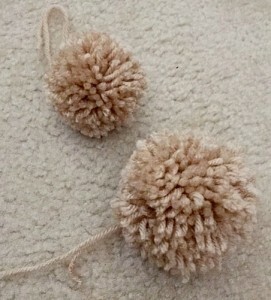 Small White Pom Poms (for tail) You can make your own or use store bought ones. 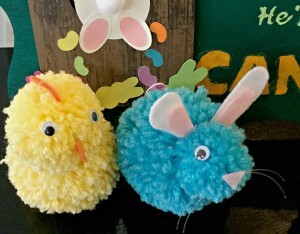 If you’re using a fork or toilet paper rolls to make your pom poms make 2 pom poms (one large, one small) in your color of choice for bunny, and 2 more for the chick. 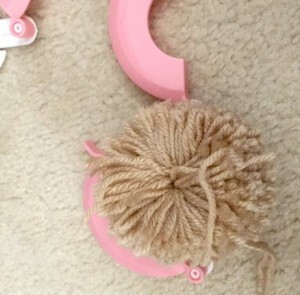 If you’re using a pom pom maker read on. Here is my set of Pom Pom Makers. I got them from Amazon. 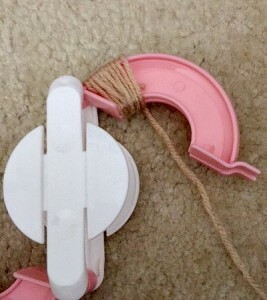 The object of this tool is to wind the yarn from one end of each curve of the “S” to the other end. So stating on the left side wind yarn tightly towards the right side. 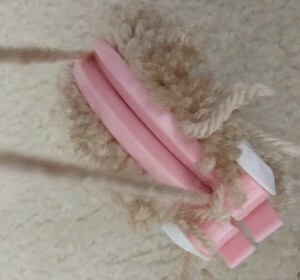 You can tuck the loose end under the yarn as you wind. Continue winding until you reach the right end. You can wind yarn back and forth from end to end for fuller pom poms, just be sure you end on the right end so you can tuck the end between the gap that’s on that end . I wound mine back and forth a total of 5 times. When you are done with the first curve shut it so it form a semi-circle, do this so the yarn you just wound will not unwind. 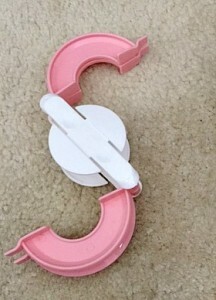 Turn the maker on it’s side and insert scissors in the gap between the 2 curves. Hold both curves shut as you cut. 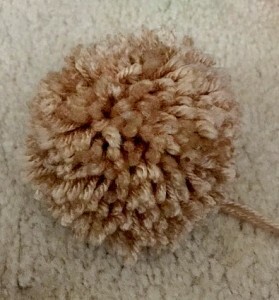 Pull yarn tightly and make a knot to secure the pom pom. I wind the strand of yarn back around the center and knotted a couple of times to make sure it was tight and secure. 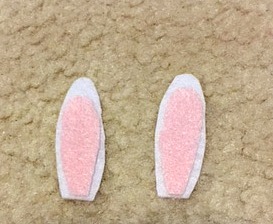 Cut out ears from the felt, I honestly just cut the shape without a template. 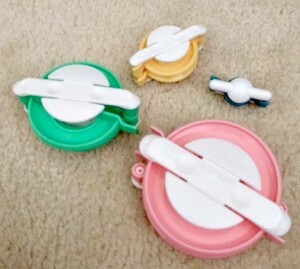 2 White and 2 smaller ones in pink. Glue the ears between the head and body. Glue the eyes in place. Cut 2 strands of fishing line and glue to the triangle for the nose. Glue the nose in place. Also glue the tail in place. 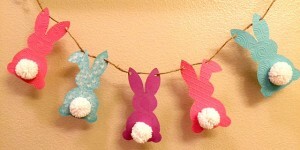 Make the pom poms and attach together like the bunnies. Cut out a triangle for the beak and top comb from orange felt. Glue comb to top of head and beak to the front of the face. 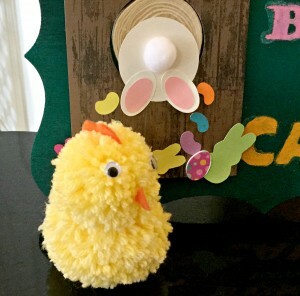 Here’s another cute DIY Pom Pom Easter craft. It’s quick and easy, a great way to use any extra pom poms, yarn, and felt. For these Mason Jar bunnies you make pom poms about the same size as the jar lids. 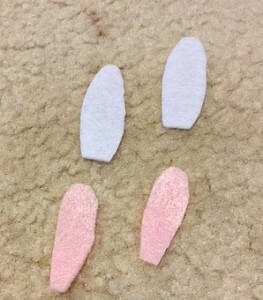 Then cut out the feet, two larger ovals in white, 2 smaller pink ovals. 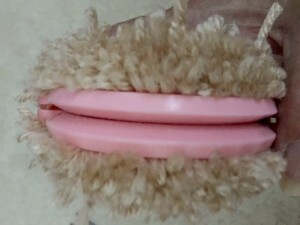 Glue the pink ovals on the white ovals and glue them on the pom pom. 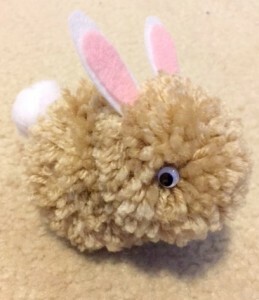 Glue on a small pom pom for the bunny tail. Fill jars up with Easter candy, I used Coconut M&M’s. Tie a ribbon around the jar and it’s good to go. 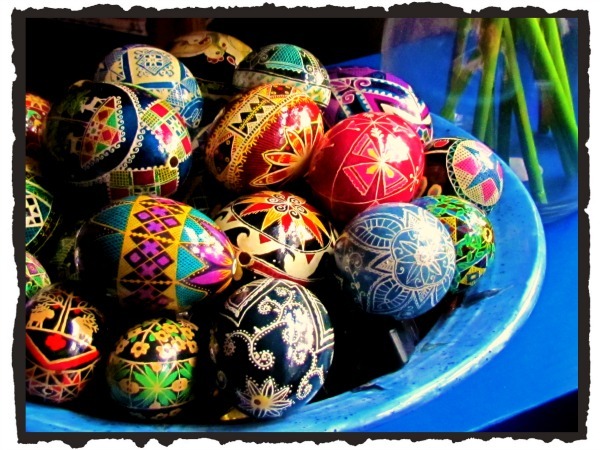 Great gift idea or a prize for your Easter Egg Hunt!